QR Codes on Gravestones…Second Verse Same as the First. They use QR codes to link to photos and videos of the dearly departed. The QR Codes are back. More precisely, QR Codes on gravestones are in the news again. In May 2011, Kim posted an excellent piece about the use of QR Codes in cemeteries,The Value Added Tombstone. For those who have always wondered, the Q and the R stand for Quick Response. For the uninitiated—or perhaps those without a smartphone—a QR code is a two-dimensional code readable by dedicated QR code readers and camera phones…. So how does it work? Well, say Aunt Sally’s family puts one on her headstone. If your smartphone has a barcode reader app installed, you can point the camera on your phone towards the code. The camera then scans the code and relays information to your phone by taking you to a website where more information is available. Maybe it brings up Aunt Sally’s memorial service posted on YouTube or maybe it takes you to an online photo album or a page on the funeral home’s website that includes her obituary or tribute. Snazzy, huh? We at DeathRef don’t think QR Codes will last in the long run. Kim and Meg, in particular, laid out some reasons as to why in the Comments section of the original post. I have my own reasons for doubting the QR Code’s long-term success since the world of information coding keeps changing. And fast. Indeed, I’ve already begun looking at Augmented Reality possibilities but I’m keeping that top secret for the time being. There’s another angle here too, which is aesthetics. I know. I know. But it’s true. Over time something like a QR Code can come to look completely normal on a gravestone, but that time has yet to arrive. For the time being, even the most discreetly placed QR Code looks a little clunky. In this regard, however, QR Codes have history on their side. Over the centuries, the symbols attached to gravestones have certainly changed and there’s no reason that the QR Codes can’t enter that historical milieu. That said, technologies for understanding those symbols also change and my money isn’t on the long term technical supremacy of 2012’s integrated computing devices. But because this entire post is about QR Codes I went ahead and generated the Death Reference Desk’s own QR Code. Here’s a link, in case you’re cheap like me and don’t actually have a phone or device that can read QR Codes(!). Death Ref’s official QR Code of DEATH! 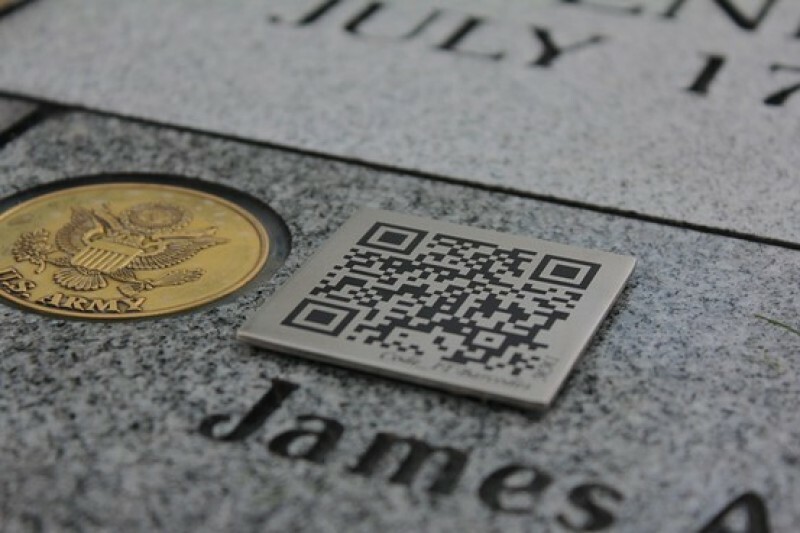 Posted by John in Death + Technology and tagged grave markers, memorializing, QR codes. Bookmark the permalink. ← A Brief Glimpse into the Future Cemetery. I remember this being new when I was in high school and that was almost 10 years ago. I actually thought it was cool then and now they just look so awful. I have no doubt that when it’s my time there will be some nicer technology. I love the idea of having a QR code that links to a memorial webpage with information for future generations. Unfortunately the cemetery where my parents are was not open to adding QR codes. I’m sure as time goes on more and more cemeteries will be open to the idea.